My final show for Winter 2015 is also my final show for Fall 2014, as Shirobako finally, or should we say sadly, wraps up. Was this the show that everyone wanted to see for this great PA Works production? Everyone’s finally on board with Murakawa! Team Emacchi in the hizzouse! They’ve worked out the creative differences, now it’s to the big work of trying to get the final episode of Third Aerial Girls actually made. 500 cuts, 10,000 in-betweens (which I’m guessing works out to a LOT more animation than is usually in an anime. There are only about 35,000 frames total), late changes, and . And then there are the personal requests, like Ema asking to do the scenes with Lucy even on top of her animation supervisor role. The things like that are a really nice touch. And even with all that life goes on, like the underling in the coloring department being urged to go on her dates before things get hectic, and someone coming up with a new (well-demonstrated) plugin for glasses highlights. In fact, it’s so busy that Segawa actually comes into the office to work until the show is finished, giving Endou a big start (have they ever said what the issue Endou has with Segawa’s presence is? He certainly gets squirrely around here, but he’s already married, so it’s not like Segawa’s after him). Does he think she’s going to hit him or something? Is Hiraoka actually being helpful? And there are other good signs, like Hiraoka seeming to feel like part of the team, offering to help out Satou with a contact. Even if he keeps his usual response of ‘betsu ni’ to everything, he certainly seems to be enjoying himself at MusAni. There’s also another credited role for Shizuka, this time as ‘Girl C’ in The Prince of Baseball (moving up from doing the crowd portion). And even though it’s a bit of a self-congratulation society, Kunogi and Ema are both getting compliments from the director and the other experienced animators, while they’re both feeling better about their own work (and even able to talk in public). But there’s still the final task, even after everything’s put together: Getting it to the stations. It’s too late to transport normally, so the delivery team is assembled, with Aoi, Erika, Nabe-P, Katsuragi, Mizuyama (who hasn’t really had a starring role, but has been around), and the specialist: Okitsu. Is anyone surprised that Okitsu shows up in an Alfa Romeo wearing driving gloves? And why does Katsuragi have an Acme Pegbar? Of course, they all have their challenges getting to their destinations, whether by land, sea, or air (does Okitsu actually get a ticket for going 7 kph over the speed limit? 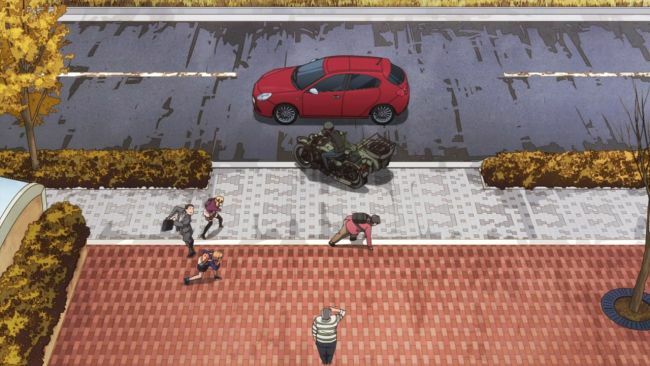 ), and Aoi is the one who has to run instead of sitting in traffic. Of course, it gets delivered, and Aoi even makes it back for the after party, in time to make a speech. I like the way that they worked Roro’s exhortation of Aoi to go to a different plane and look farther to decide what she wants to do into the scene of her speech, as she actually does get to look out over a group of hundreds of people who contributed to Third Aerial Girls, a size that in aggregate is much more impressive than as individuals, but as individuals possess talent and creativity and vision to get something that we all enjoy made, and realizes that all those in the past have contributed to where we are now, as well as all those viewers. Will the girls ever make their personal project? Who knows. But even as corny as that ending was, it still was very touching. People do corny things. And reaching for that goal is what it’s all about. “PA Works only does shows about teenagers.” “PA Works can’t end a show properly.” “PA Works shows look great, but don’t have a good enough story.” Hark, I hear the call of the naysayers. Well, I guess if some people can be JC Staff fanboys or Type-Moon fanboys (nobody’s an A-1 Pictures fanboy, are they? ), I can be a PA Works fanboy. And that’s ok. But to all those criticisms above, I present Shirobako (even though they’re still saying those things after I presented Uchouten Kazoku to them a year and a half ago). Shirobako was excellent, there are no two ways about it. Maybe it was a bit sanitized version of making anime, where the good guys succeed and all troubles are overcome, but who would want to see things fall apart like they did where Hiraoka used to work? That’s only good if you are an awful, mean-spirited person. And even as idealistic as the show is, I think it was still probably pretty realistic, at least of what you want your production to be like, of course without all the roadblocks. And even though I work in an entirely different field, it did a good job of portraying that office environment, one that’s familiar to me. Working across disciplines, getting cooperation and buy-in, and having to deal with a rush at the end. It’s a fairly universal thing, and it’s certainly not all bad. I would almost like this to be aspirational, in that everyone who sees it tries to make their office more like the MusAni office (and NOT like the Servant x Service office). There’s not much to say about the actual production of the show besides the fact that it does PA Works proud. It really did feel like this series was kind of a love letter to themselves, and I almost want to say that “of course” it’s directed Tsutomu Mizushima, who has now made three of my favorite shows (Shirobako, Witch Craft Works, and the best show, Girls und Panzer), and one of Fosh’s (Ika Musume). It matched fun situations with interesting characters, and while there might have been a little bit of spinning out at the end with Kinoshita and Nogame, I think that the time the show spent on that was well done, and worked within the context of the show. 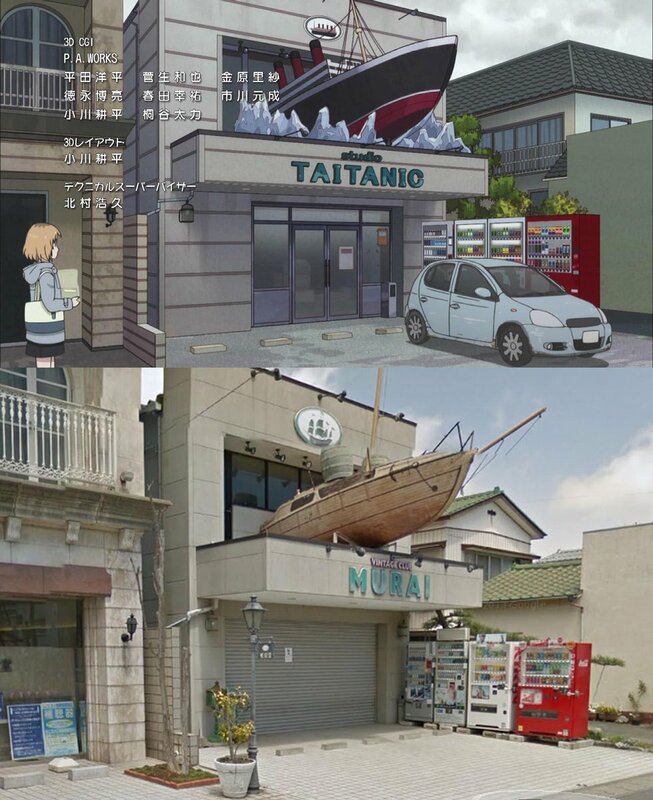 Art and sound were consistently good, and PA Works turned their terrific backgrounds on an urban setting that worked well (one funny note: Studio Titanic’s building is based on an anime store named Vintage Club Murai, an anime, manga, and merchandise store in… Ooarai, where Girls und Panzer is set. They even dressed the place up as Taitanic for a gag). I don’t know if I have anything else to say, except that I hope everyone else enjoyed watching Shirobako as much as I did. 6 months of a great show aren’t nearly enough, especially one that could easily continue, or even spin off two other series in Exodus! (episode 1 was a lot of fun) and Third Aerial Girls Squadron (whose episode 1 I’m eagerly awaiting). I’m not expecting to ever see any of those further anime made, but one can hope. A most excellent anime and my favorite of the last two seasons. I can’t remember a misstep anywhere in it. Even initially unlikeable characters like Tarou and Hiraoka got enough development that you realized they weren’t so bad after all, though they both have a ways to go before they can be likeable. I’m sure we only got a glimpse into what goes into making anime, but such a great glimpse it was. If there’s any kind of sequel, I’m down for it. And I put Shirobako a while back on my “to buy” list when it becomes available in NA. Looking at past PA Works shows, it looks like it probably will be available licensed for US Sale. Uchouten Kazoku, Tari Tari, even Red Data Girl, are all available from Amazon, and not as imports, so it’s very likely Shirobako will be as well, and it’s licensed by Sentai Filmworks (so do NOT read the box description, I don’t know who they get to write them, but so awful). Easily one of the best, six-month long, rides I’ve been on in this hobby. And that is quite a challenge. Think of a two-cour show that didn’t have that “near the middle of the second cour blues” You can’t. Only now you very much can. …and credit where credit it due. Let’s face it, anime fandom is like a murder of crows, ever on the lookout for the next shiny thing to pluck up and make their own. It’s not at all difficult to think about how much both Exodus and Third Arial Girls endures. But both of these “shows” now have a lasting exchequer in our imaginations. And they barely even exist. And I think they endure, and I think people want full fledged series of them even more because in our imagination, thanks to watching their daily lives, they are just that strong. GJ-bu, MusAni…and of course PA Works. There was definitely no lull, no filler, in that episode 16-20 range that frequently is where they hide the less interesting arc, or you kind of get tired of the show. And I think it helped that everything we saw of Third Aerial Girls Squadron looked cool. It looked like a show that all of us would enjoy. So we *wanted* to see MusAni succeed at making this show. I don’t know if history will repeat itself, and director Mizushima will once again bring the anime in one of his anime to ‘life’, but Third Aerial Girls Squadron would be much better than Kujibiki Unbalance. Saying “Third Aerial Girls Squadron would be much better than Kujibiki Unbalance” is like saying the Sun will rise in the east tomorrow. I thought this show was going to be omega boring. You know, like a documentary about the minutae of making anime. Shirobako proved me wrong very, very quickly and I’m glad it did. I’m really glad Shizuku got to do something in the end. Life was so rough for her…but now she’s well on her way to success! …Or at least having a mediocre paycheque to get by on! This was a nice ending, but I would love for there to be more. I hope it does well and there’s a high demand for more Shirobako! The show ended at the place it should end. All of PA Works shows could continue, because they are always “This is this portion of these lives”, but sometimes the ends don’t really please people as much as this one. I really doubt there will be more, just because PA Works doesn’t do that. Maybe Zuka’s star is on the rise, now that she’s gotten over the ‘inexperienced’ hump. I did like how Ema had the same reaction to Zuka’s lines that Aoi did, even a while later. And I don’t know exactly how the pay scales work, but it wouldn’t take much work for Shizuka to eclipse Ema’s animator pay. That’s one reason she needed to get into Supervisor roles. First time commenting. I’ve been reading your post, and find them quite insightful sometimes (I knew that wasn’t a standard Mirage). Great read from someone who enjoyed this swoh as much as I did. Shirobako for me is the best show in the past year (12 months). It has an interesting story and great characters. Even though I don’t remember their names, this last episode showed me that I remembered 90% of them by role. A show that makes annoying co-workers tolerable is definitely good in my book. For example, Tarou makes things interesting and Hiraoka’s situation is understandable. Can’t say I want them out of the story. Now a note about Segawa and Endou. I believe what they have is something called creative differences. Segawa is more like an engineer, while Endou is more artsy. Observation of the art department at my university, I can clearly say that these two types don’t get along. A friend of mine (artsy type I assume) actually burned her own work that got approval from a technical type. Imagine that trying to work together. Those of us from engineering can’t really see what was wrong with it. But in their eyes, there was something else. I don’t have to work with Tarou or Hiraoka, so it’s easier for me. But I’ve worked with bad co-workers before, and you just do it. It even becomes a bit of a bonding experience for everyone else. But even at that, those two weren’t all that bad. They were just worse than everyone else, so they’re the ones you focus on. Consider that Tarou and Hiraoka were actually good influences on the other, improving both of them when they were working together. That points out that it’s not all bad. I’ve actually worked with people who were productivity sinks, in that when they’re there, they pull down other people’s productivity as well, even when (or especially when) they’re trying to be productive. I can understand the creative differences part of their separation, but that doesn’t explain Endou’s obvious fear when Segawa’s around him. He seriously acted like he was afraid she’d hit him, and we’d never gotten any kind of indication from her that she was violent or hated him or something. I did get a little bit of “I trust women more than men” from Segawa, but maybe that was because the other men she interacted with on the show were Tarou and Hiraoka. I’m just wondering if maybe they knew each other as kids and Segawa used to pick on Endou or something. 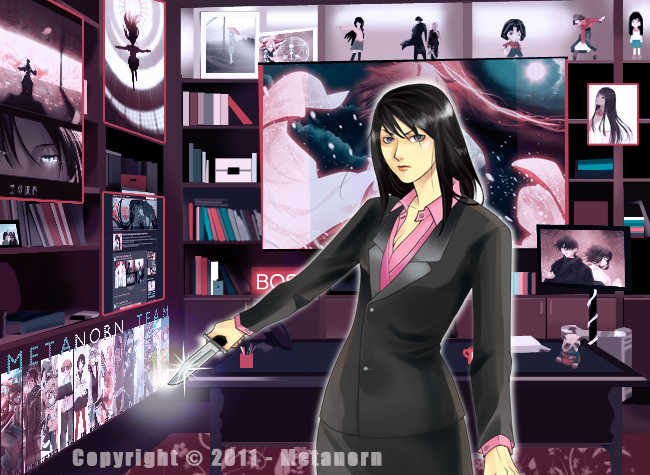 Oh, and to me, destroying your own work just because it got someone else’s approval is just hubris and spite. If you think it was good work, then why does someone else thinking it’s good diminish it?